Historians have always produced differing interpretations of past events, and they probably always will. The reasons for this can be separated into two main types. The first type concerns the historian himself, his attitude and his motivation, and the second concerns the state of historical knowledge and scholarship at the time the historian is writing. "The history of Churchill shows .... the malignity and extent of the corruption which had eaten into the heart of the public morality. An English gentleman of good family attaches himself to a prince who has seduced his sister, and accepts rank and wealth as the price of her shame and his own. He then repays by ingratitude the benefits he has purchased by ignominy, betrays his patron in a manner which the best cause cannot excuse, and commits an act, not only of private treachery, but of distinct military desertion." (Review of Hallam's Constitutional History, Edinburgh Review, September 1828). "The prince of literary rogues, who always preferred the tale to the truth, and smirched or glorified great men and garbled documents according as they affected his drama". (W.S. Churchill, My Early Life (1930, 1948 reprint), page 110). The passage quoted above was written by Macaulay before he entered the House of Commons as a Whig. In all his work he tended to take the Whig view of any incident or political issue, and although he usually gave praise where it was due, he naturally inclined towards a negative view of a Tory such as Marlborough. Winston Churchill of course, being of the opposite political persuasion, was similarly anxious to praise his illustrious ancestor. So the serious historian in trying to assess the worth of these two popular writers must understand their political outlook and attitude. He must also understand the writer's motivation. Churchill described himself as an amateur historian, and his motivation in writing his biography of Marlborough was to find something to occupy his fertile mind while he was in the political wilderness, and also to earn some much-needed cash. The same cannot be said of Macaulay, who considered his political career as the amateur side of his life. He devoted long hours to painstaking historical research, although his nephew, G.O.Trevelyan, explained that when he came to write down his great History of England he did so largely from memory. "As soon as he had got into his head all the information relating to any particular episode .... he would sit down and write off the whole story at a headlong pace .... as it flowed straight from his busy brain to his rapid fingers." (G.O. Trevelyan, The Life and Letters of Lord Macaulay (1876) Vol II pp 224-5). He was well aware of the popularity of his books, and was clearly playing to the gallery much of the time. Contrast this with, say, Professor F.M.L.Thompson, whose book on English Landed Society in the 19th Century has become the standard authority on the subject. This was designed from the outset to be as rich in scholarship as Macaulay's work was designed to be rich in literary brilliance. Thompson's book took several years to compile, and is clearly far more reliable as "good" history than Macaulay. His motivations are different, and the resulting credibility of his interpretations is different. Every historian is to some extent influenced by the current issues of his day, be they political, moral, religious or whatever. Taking a rather extreme example, one would not expect Gibbon writing in the 18th century to take the same view of the influence of Mohammed and Islam as a modern historian writing from a feminist viewpoint. "the pioneer historians of a hundred years ago .... had not the machinery we moderns have, the masses of published documents, the Historical Manuscripts Commission volumes, the learned periodicals, and whole libraries of monographs and studies of particular points." (G.M.Trevelyan, letter to the Times Literary Supplement, 19 October 1933). A case in point is that one of the prime documents on which Macaulay based his opinion of Marlborough's "treachery" was subsequently shown to be almost certainly a forgery. In truth, primary sources are not often forged, but they are sometimes incomplete, fragmentary or obscure. A letter may have a page missing or be partly illegible, a piece of Roman pottery may be broken, or a photograph may be faded with age and difficult to place. However, modern techniques as diverse as archaeological dating to check authenticity, and statistics and economic analysis applied to existing data can sometimes lead to new insights. Also some primary sources may have been overlooked or locked away in private collections of family papers, and some, like the daily accounts kept by the managers of estates or businesses, may be so extensive that it is impossible for one historian, even with a team of research assistants, to cover all the ground in a reasonable time. There is always a temptation to select the facts to fit the interpretation, rather than select the interpretation to fit the facts. The unwitting testimony present in a primary source can often be interpreted in different ways. In 1992 controversy raged in historical circles over the interpretations by two eminent historians of documents relating to the role played by the English nobility in the English Civil War. Professor Kishlansky of Harvard University accused Dr Adamson of Cambridge University of "manipulating evidence", and Adamson riposted that Kishlansky's criticisms "depend on misreadings of primary sources or misunderstandings of parliamentary procedures". (The Times, 21 February 1992). This dispute neatly highlights another possible reason for different interpretations. The Times leader writer on the same date notes that the quarrel is part of an ongoing one about historical method, whether a historian should start with facts or with theory. Theorists such as Comte and Marx have argued that several patterns can be detected in the way society progresses, and their followers tend to interpret past events in the light of those theories rather than first and foremost from individual primary sources. There was a time when followers of such as Ranke, who was one of the pioneers of the systematic, almost scientific, study of historical sources, believed that it might be possible to write a definitive history which would stand more or less for all time. Very few people hold to this view nowadays, indeed it is now generally recognised that history is not a scientific discipline at all, but is one of the major arts. No two artists will look at a subject and interpret it in exactly the same way, so why should anyone expect two historians to do the same? This is an exquisite piece of music. It is at the same time lively, stately and easy on the ear, and has a driving intensity which catches the listener's attention immediately and makes him eager to hear more. It reflects perfectly the ordered and courtly way of life of the audience for whom it was written. As its name suggests, one can imagine a stately minuet being performed to it in an imperial Viennese ballroom. But this is by Mozart, and is one of his best-loved works. So what is it about the elements and structure of the piece that makes it so special? The two most immediately prominent elements are the rhythm and the melody. The rhythm is a regular 3/4 metre which is played at a brisk constant pace: nowadays one might say at the tempo of a Viennese waltz. There is an urgency about the beat which drives the piece forward, and it is emphasised quite strongly by the lower strings and the timpani when the whole orchestra is playing. In order to lay emphasis on the dance-like rather jumpy rhythm of the minuet, many of the string notes in the louder sections are played staccato rather than being allowed to flow into one another as in the softer sections. The melody like most good tunes is very simple. It is played throughout by the violins, with the other strings, and sometimes the woodwind and brass, providing the harmony. Occasionally the tune is also carried by the flute and clarinet. The rich harmonic texture of the piece is created by the smallish orchestra, which is dominated by the string section, with woodwind and a few brass instruments providing a contrast in timbre when needed. There is one melody which is played comparatively softly, but otherwise the dynamics are fairly loud. The piece is in two sections, each repeated, with the second section being a few bars longer than the first. The first section opens with a fairly loud chord and a short series of rapid notes rising up to another chord followed by a similar series of notes. This melody (A) is played on the violins accompanied by the full orchestra. The second half (B) of this opening section is played more quietly, on the strings alone to start with, with the woodwind joining in at the end. The first half of the section rises in pitch, and the second half with its gradually descending pitch provides a very satisfying counter-balance to it. The contrast between the two halves is also heightened by bringing in the altered timbre of the woodwind to help carry the melody in the last few bars. Next, as the audience will have expected, the first section is repeated so that its musical structure can be properly appreciated. This time it is a little louder, and there is no woodwind in B. The second section starts with a short bridging passage bringing us back to A and B, repeated again but each time louder with fuller orchestra and added notes, but basically the same tune. The whole builds up to a final tutti in the classic way, down to the gentle and satisfying finish. Why then does all this make it so special? It was not of course designed to be played by itself, but rather as the first part of the third movement of a complete symphony. It has all the elements and structure of many other classical pieces of music. It is tuneful, rhythmical, ordered, simple and easily recognisable. But it needed the unique touch of Mozart's genius to knit all these elements together to create the sublime piece of music that it is. These two paintings, one by a giant of the Italian Renaissance and the other by a little-known mid-Victorian Englishwoman, both have as their centrepiece a woman of considerable beauty in acute misery. Mary Magdalen mourns the death of Christ, the central figure of her earthly life, whereas the nameless Victorian woman is deeply despondent about the outcome of a decision that is probably crucial to her whole future well-being. Titian presented his picture to the influential collector Cardinal Farnese in 1567. It was of course a highly suitable subject for a Cardinal, Mary Magdalen being a much revered symbol of penance for the devout. Apart from the title, there are several clues to the identity of the subject which would have been immediately recognisable to the Cardinal and his circle. To the left of the picture is a small pitcher or jar, which was the conventional symbol used in pictures of the Magdalen, representing the ointment she used to anoint the feet of Christ. Another Magdalen symbol is the holy book open in front of her on the right of the picture, and resting on a human skull, the symbol of death. 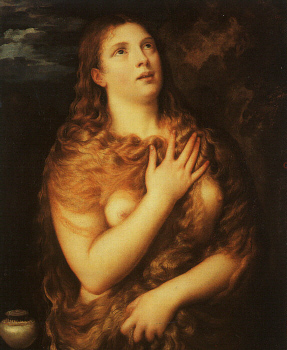 Titian uses the pose taken from the classical Medici Venus statue, portraying her with her eyes lifted towards heaven. Tears can be seen below her right eye. Her right hand crosses her body and rests nearly on her left shoulder, while her other hand also crosses her body but slopes slightly downwards. The effect of the two lines formed by the arms is to stress the overall upward look to the picture, which is most noticeable in the poise and tilt of the head. This idea of the repentant Magdalen suffering for her past sins first appears in the Donatello Magdalen statue about 100 years earlier, but it was not much followed up. That statue shows a classical woman suffering all physical deprivations, but here Titian shows, probably for the first time, repentance without physical deprivation. This is no stylised portrait like a Perugino Madonna, but indeed the slightly open mouth and the whole face and neck have, to modern eyes at least, a positively sensuous aura about them. Contrast this with the central female figure in the Osborne picture. As one would expect in a narrative picture of this kind, the woman takes up less space than the Magdalen in the Titian. But the most striking difference is that the whole pose is essentially downwards facing and dejected. She stands in the centre of the picture, her two hands nervously playing with a length of cord or string and pointed towards the ground. Her face has a sad and resigned air to it, with a faint frown on her forehead. Although her eyes are not actually visible we know from the angle of her head that she is looking down. She is not looking at anything in particular but stares aimlessly at the floor while she waits. Her face is of a more conventional beauty than the Magdalen's, and has an air of gentility about it which admirably suits the subject of the picture. The Magdalen, as befits an iconic picture, fills most of the canvas, and so that we may see more of her face and upper body she is shown at three-quarter length. But the other picture has to tell a story. Hence we have several figures in the scene, of which the most important are shown full length. The dealer wears a subtly negative expression; his eyebrow is raised in thought and he is rubbing his chin with his finger, but his lips are beginning to purse and one can almost sense the head beginning to shake. He is closely observed by the boy, who gazes anxiously up at his face. An interesting piquancy is added by the dealer's assistant, who is standing on a ladder looking down at the picture, which suggests perhaps that he at least believes it to have some merit. So far the reasons for the particular composition in the Osborne picture are fairly evident, as are the bones of the story it tells. But it was the custom in Victorian times to insert in the picture various clues which suggest some additional interpretations that can be made. For example, the man on the left holds a picture of a ballerina. Does this hint at the woman's former occupation? The way her hands are occupied draws our attention to them, and thus we can notice that she wears no wedding ring. And then there is a clerk sitting at the back of the room presumably totting up the money. Perhaps he is there to stress the precarious monetary state of the woman. The difficulty of getting a picture painted by a woman accepted by Victorian society is another subject hinted at, indeed the whole idea behind the painting might well have been a comment on her own situation as a female painter. There is also the contrast between working for a living and painting as a leisure pastime of the genteel classes. Finally we can see that the weather outside is awful, and two figures at the back are looking out at it. Does this mean stormy weather ahead for the unfortunate young woman? Titian too has added some gracenotes to his picture to heighten the effect. As was often the custom in iconic pictures, behind the central figure a landscape is sketched. Behind and to the left are some rocks and trees, but on the right there is a rural landscape in brightish sunlight. Here despite the sun there is a slight sense of all not being well, the trees seem to sway in the wind, and there is a restless look about the clouds in the sky. The landscape seems to be in line with the Magdalen's thoughts. This landscape also helps to create a sense of space in the picture. The horizon is about one third of the way down, but as we appear to be on a lower level as the Magdalen, she, despite the rocky scene behind her, appears higher up than the scene in the distance. There is no horizon as such in the Osborne, but the line of the buildings outside helps to suggest that we are positioned level with the woman and the dealer. The sense of space inside the shop is achieved with the perspective of the desk, and the often-used device of a patterned floor. The space is very clearly defined and box-like in good academic tradition. Both pictures have, as usual, the light coming from the left. 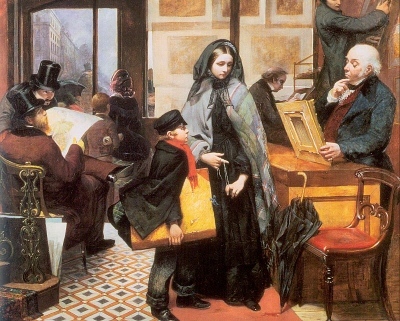 As the scene outside the Osborne picture is a stormy one, artificial lighting, which is placed at the back and on the left, has to be used in the shop. In the Titian the whole of the Magdalen herself is lit from the front left, and the light also helps the eye to catch the symbolic jar, the skull and the pages of the open book. The predominant colours in the Titian are various shades of brown, blending well with the flesh colours of the central figure and her white dress. Red is used only sparingly in the dress and on the book. There is much greater use of red in the other picture, with the floor, the carpet, the chair and the boy's scarf all fairly prominent. The woman's shawl has, like the Magdalen's dress, a touch of red in it. Apart from this the colours are dull browns, greys and blacks, as one would expect in a shop on a dull day. So we have two quite different pictures from two different epochs in two different genres. The Titian has no pretence to depict a real life scene, but shows a tormented Magdalen with flowing disordered hair and dishevelled clothing. The other is an intriguing and poignant narrative painting, showing a scene from real life with real people in realistic poses. Both paintings achieved their objectives: the Titian was designed as an art object gift to a Cardinal, and the other seems to have succeeded in jogging officialdom into accepting a painting done by a female - the Osborne was one of only a few paintings by a Victorian woman to be exhibited at the Royal Academy. One cannot therefore be dogmatic about which of the two is the more successful at achieving its objectives. Most people if asked would probably agree with the statement that we are justified in punishing criminals both because they deserve it and because it is a deterrent to future crime. Yet as a guiding principle for enacting laws about crime and punishment, or as a basis for a moral philosophy on the subject, it leaves much to be desired. Society's attitude towards this issue has undergone enormous change through the ages, and indeed varies hugely between different societies today. In Britain we no longer hang sheep-stealers, and we have never indulged in the lopping off of limbs for offences that in our eyes at least are relatively unimportant. So it is helpful to have a set of philosophical principles against which one can measure one's recommendations or decisions for the justification and assessment of the appropriate severity of punishment for crime on an on-going basis. Apart from anything else, anyone actually undergoing punishment for a crime at least deserves a justification from the State that is meting out that punishment to him. The two most prevalent theories about punishment are expressed in the statement above. The retributivists, like the Mikado, have as object all sublime to let the punishment fit the crime. In other words the criminal should be given a punishment which has as its sole purpose a sort of revenge on the part of society against the criminal, and the greater the crime the greater should be the punishment. There may of course be other desirable consequences, such as deterrence to others or the same individual from committing similar acts, an opportunity to rehabilitate those in prison into a more socially conscious frame of mind, and the protection of the public from a dangerous individual. But these considerations are not the starting points of retributivism. The utilitarian theory of punishment on the other hand holds that punishment should only be inflicted if by doing so the total sum of human happiness is increased. If the punishment of an individual causes more suffering to him than it causes increased happiness to the rest of Society, then, according to this theory, the punishment is too severe. There is heavy emphasis on deterrence as the main purpose of punishment. All those good citizens then who subscribe to our first statement are implicitly agreeing with both these theories. So the question arises as to whether it is practical to hold to both of these theories at the same time and thus develop a suitable code of punishment. Unfortunately each of these theories on its own if taken to extremes leads to situations which one intuitively feels are unacceptable. One of the main arguments against retributivism that is sometimes mounted by philosophers is concerned with the extent to which the criminal is responsible for his actions. If, as the determinists believe, every action since the beginning of time was pre-ordained, then there is no such thing as absolutely free will, and the criminal was therefore not to blame for his actions, but was a victim of the circumstances in which he found himself, and which were caused by all the actions that had occurred by everyone and everything since the year Dot. Thus if the criminal cannot be held to blame for his actions, it would be unjust to punish him solely for the sake of retribution. If on the other hand one does believe in free will, it is possible to examine the way in which Society has treated the convicted criminal hitherto before passing an appropriate punishing sentence. A well-educated intelligent thief from a respectable background can be assessed as deserving of more punishment for the same crime as the product of a broken home with no job and a low IQ. The utilitarian, unlike the retributivist, is more concerned with the consequences of the punishment and its deterrent effect than on revenge for the crime itself. This pursuit of the greatest happiness for the greatest number can lead to some fairly bizarre consequences. For example, suppose a tax inspector has been the victim of a fraud. Few people like tax inspectors much, so more people are likely to be happy about hearing that the victim of a confidence trickster was a tax inspector than they would if his victim was, say, the local vicar. Thus a strict utilitarian would insist that frauds against vicars should be more severely punished than frauds against tax inspectors. Again, if there is little evidence that punishment for the crime actually deters the commission of that crime, then the strict utilitarian will argue for little or no punishment in that particular case. There is little evidence, for example, that the punishment of prostitutes for carrying out the world's oldest profession has any deterrent effect whatsoever, so one might as well give up punishing them, and turn one's attention to other means of containing the problem such as deterring the potential customers or setting up state-controlled brothels. So if retributivism and utilitarianism both lead in their different ways to different largely unacceptable conclusions, one must either adapt each of the theories to meet the desired conclusion, or one must continue to muddle along with a pragmatic approach that does not rely on any underlying moral philosophy but is acceptable to the democratic majority. The issue of determinism and free will is currently the subject of much debate. Scientists are backing away from the idea that everything is pre-ordained, indeed Stephen Hawking and other eminent theoretical physicists now suggest that not only does an element of randomness enter into the outcome of events at sub-atomic level, but also that it was just that element of randomness in the events immediately following the creation of our universe that led to the formation of our universe in the way it is now, even to the formation of the conditions for life itself as we know it. They even go so far as to suggest that there may be other Universes, created at the same time as ours, from a different set of random circumstances that set up our own. This could give rise to a moral theory that suggests that an individual can indeed be held responsible for his own actions in the context of our particular Universe, given the random nature of previous and present events, and that subject to no inherent gene-deficiency the individual is free to think and act for himself. An all-embracing utilitarian theory of punishment might consider the effect on Society as a whole of abandoning a retributivist theory in favour of a strict utilitarian one. If following the latter were to lead to apparent anomalies, then Society in general would feel bad about it and emotions such as a sense of a lack of fair play and natural justice would be dominant. This in turn, while not necessarily leading to suffering, could be said to lead to a decrease of total happiness and therefore should be avoided. In conclusion then, it seems to me that the best possibility of a future philosophy for the justification of punishment lies in a basically retributivist one, acknowledging that mankind does have free will within the framework of our Universe. This could be reconciled to a utilitarian form of philosophy that takes into account the somewhat primitive but nonetheless prevalent emotions of revenge, fair play and natural justice which give happiness to all. "Weep not; he is in bliss," they said. A child, not now forlorn. A mother, a mother was born." This sad little poem conveys its meaning and effect in several very simple ways. It has a simple form, in keeping with its fairly simple content and message. The eight lines of the poem are all regular in rhythm and form part of a rhyming scheme which is abab,cdcd. There are four beats to the odd lines and three to the even, and each line has a caesura in the middle. The key to the whole poem lies in the last line, and the slight breaking up of the regular rhythm by inserting more syllables than usual is a deliberate device to make the reader pause, and to give the line added poignancy. The meaning is simple: it is ten years since the mother gave birth to a child who died when new-born. In trying to console her they said that the child was now in Heaven - "in bliss", but she is inconsolable because she became a mother at that point, and is still forlorn. Poetic devices such as alliteration are not much used in the poem, although the striking phrase "not now forlorn" is perhaps all the more so because of the use of the n�s, particularly when following those in the previous line. More important in contributing to the overall effect is the slightly unusual order of words and phrases. The poem starts with the bald statement "One wept", setting the key-note that it is the weeper that is the subject of the poem, not the baby. And the sentence is placed firmly in the present, while describing neatly the events of ten years ago. The first two words of the third line then echo the rather stark beginning: �Weep not". The response by the mother invites the listener to compare the fates of the baby and herself by not using the first person: a child was born in pain, and a mother was born in vain. The poet deliberately uses some contrasting words to heighten the effect: "child - mother", "dead - born", and "bliss - pain". She also repeats some words and phrases -"ten years ago", "wept/weep" and "mother"". Finally the last two lines are made all the more poignant by using "oh", assisted by the internal rhyme with "ago", and the unusual and unexpected sentence "a mother was born" is the perfect way to round off the poem by returning to the main subject in the first line, echoing the title of the poem, and pointing up the tragic sadness of this particular experience of motherhood. Twelfth Night is possibly the funniest play Shakespeare ever wrote. But therein lies one of two major problems in discussing the intended blackness and cruelty of much of the comedy, and in achieving a successful production of the scene on the stage. Malvolio is one of the great comic inventions of all time, and tends to dominate much of the play to the detriment of the whole. The two great set-pieces, the box-tree scene (II v) and the yellow stocking scene (III iv), can be uproariously funny, and modern audiences rightly expect them to be so. Almost inevitably the audience's sympathies are thoroughly engaged with Malvolio rather than his tormentors, and when it comes to the crucial dark house scene (IV Sc ii) it is difficult to strike the correct balance. The second major problem is that the perception of what is funny in dark comedy has probably altered considerably since Shakespeare's time. For example, in today's more socially aware world, lunatics are looked upon much less as people to be laughed at and mocked, and much more as people to be sympathised with and cared for. Thus Feste's teasing of Malvolio, and the latter's protestations of his own sanity, alter the balance of response in a modern audience away from Feste and towards Malvolio. The key to a successful resolution of these two problems for Act IV Scene ii lies in the dramatic presentation of what has gone before. The black mood is already set by the mourning clothes of Olivia and her household. Malvolio's first words in the play show him in contemptuous conflict with Feste: "What think you of this fool, Malvolio, doth he not mend?" "Yes, and shall do, till the pangs of death shake him." (I.v.70). Malvolio's subsequent attack on the fool is unmerited, cruel and pompous, and Olivia's defence of an "allowed fool" is important and unequivocal. Feste's response to her, "Now Mercury endue thee with leasing, for thou speak'st well of fools" (l 92) has to make sure the audience is entirely on his side at this point. Again, when Malvolio interrupts the party in II.iii, he is accused of being nothing more than a steward by Sir Toby. He turns really nasty at the end and takes it out on Maria - someone much lower in the social pecking order than Sir Toby - promising to sneak on her to the boss: "She shall know of it, by this hand!" (II.iii.119). He can even threaten to hit her with that hand, emphasising his nastiness, and giving added motivation for Maria's role in the subsequent plot against him. Malvolio and Feste do not meet again until IV.ii. It has been suggested that the substitution of Fabian for Feste in the box-tree scene may have been partly because Shakespeare realised that Feste's popularity with the audience may have distracted too much from Malvolio, and that the confrontation would be better made on more level terms in IV ii. And what an extraordinary confrontation it is. Malvolio, the pompous, self-loving, arrogant social climber, is tormented by the enigmatic, bitter, insecure and misanthropic Feste. To many people, including, famously, Peter Hall (Folio p.50), Feste is the most important character in the play. He sees through Olivia ("Take away the fool, gentlemen" (I.v.66)), Orsino ("Thy mind is a very opal" (II.iv.73)), Sir Andrew ("I shall be constrained in't to call thee knave, knight" (II.iii.62)), and possibly even Viola ("Now Jove in his next commodity of hair, send thee a beard!" (III.1.43)). He has had no difficulty at all in seeing through Malvolio, and rejoices when his big moment comes. It is not only the dramatic presentation that sets up the situation of IV.ii, but also the language and imagery that is used throughout the scene. Malvolio's supposed madness has been previously described as being in terms of possession by the devil. "He is sure possessed, madam" says Maria before he appears in his yellow stockings (III.iv.9), and afterwards Sir Toby, Fabian and Maria all tease him by accusing him in various ways of being in the clutches of Satan. This is very dark humour, made darker still by the fact that Feste disguises himself as a priest, Sir Topas, who will cast out devils. "Out, hyperbolical fiend, how vexest thou this man!" (l.25); "Fie, thou dishonest Satan" (l.31), and in his parting mocking song, he compares himself to the old Vice who "Cries 'ah ha!' to the devil" (l.126). The darkness is further emphasised by Malvolio's incarceration in a dark house, which was the standard treatment for lunatics in Shakespeare's day. Malvolio keeps complaining of the darkness, but Feste (as Sir Topas) cleverly diverts the complaint as being one of the mind. "I say there is no darkness but ignorance, in which thou art more puzzled than the Egyptians in their fog" (l.42). There are echoes here of the earlier exchange between Olivia and Malvolio: "Why, how dost thou, man? What is the matter with thee?" "Not black in my mind, though yellow in my legs." (III.iv.24). Shut in his dark room, Malvolio keeps begging for candles and light (ll 81, 106 and 111). The mental torture is remorseless. Malvolio cries out three times in similar fashion that he has been "wronged" (l.28), "abused" (l.46) and "notoriously abused" (l.87), and no less than six times that he is not mad (ll 29, 40, 47, 88, 107 and 116). The pressure is so persistent that Shakespeare interrupts the scene with Sir Toby suggesting that the whole thing may have gone too far: "I would we were well rid of this knavery. If he may be conveniently delivered, I would he were" (l. 66). Even Feste's song is cruel: "My lady is unkind, perdy, ..... she loves another" (ll 74, 76), and by the end of the scene Feste's victory is complete. He has totally cowed Malvolio into submission by agreeing to get the begged for light, paper and ink. This is not done in a spirit of compassion and reconciliation - he has more cruel taunting to do in the last scene - but in a spirit of triumph over a beaten foe. The staging of the scene is important. In Shakespeare's time the "dark house" may well have been represented by the trapdoor in the centre of the stage, or by a barred door at the back. In this way only the hands, and possibly the face, of Malvolio would be visible to the audience. The availability of modern stage machinery, however, would allow an audience to see both Feste and Malvolio, but without Malvolio being able to see Feste. This could be done by dividing the stage in two, either horizontally by a bridge, with Feste up above and Malvolio below, or with a dividing wall running from the back to the front of the stage - Malvolio's half being dimly lit to represent the dark house. In this way we could see the full horror of Malvolio's treatment, with perhaps leg-irons or rope around his yellow-stockinged legs, with his hands free to gesture through the bars to Feste. ("Come, we'll have him in a dark room and bound" said Sir Toby (III.iv.134)). The rather clumsy "business" of Sir Topas' false beard could be cut out, along with the words in ll.1 and 63. After all, as Maria freely admits, "He sees thee not" (l.63). Sir Topas should, however, wear the gown - if for no other purpose than to remind the audience that Feste is playing the part of an exorcising priest. He can flap this gown about in jumping from side to side of the dark house entrance when he is playing both parts at the same time, adding to Malvolio's confusion and the audience's amusement. This gown also serves as a kind of symbolic representation of something evil and dark. Most actors playing Feste adopt a pompous deep voice for Sir Topas, although perhaps a better idea would be to caricature a well-known modern-day reverend by using a harsh Northern Irish accent. This lightens the rather heavy humour of some of the nonsense spoken by Sir Topas, and leaves the audience in no doubt as to whether it is Feste or Sir Topas that is speaking. Any humour that sane people can extract from Northern Ireland is profoundly black. Throughout the first half of the scene, Malvolio should be really tormented and in anguish, except for his pronouncements about Pythagoras. Here he can remind the audience of his former pomposity "I think nobly of the soul, and no way approve his opinion" (l.54). After all, this is an answer that ought to be acceptable to a priest, but to Malvolio's despair it provokes Feste/Sir Topas to yet more torment. In the second half of the scene Malvolio twice refers to his hand, and each time he can take the fool by surprise by thrusting it through the bars, and perhaps clutching Feste's clothes. If the hand is well lit while the rest of the body is in comparative darkness, an added pathos can be built up in the scene - a gesturing hand can be most expressive. An interesting effect can be made by having Malvolio utter an anguished cry at the end of the scene, which can then run on to the next scene with Sebastian, while he says that "Yet 'tis not madness" (IV.iii.4). Madness is a theme which pervades much of the last act, and the black humour of it will be all the more effective if Act IV Scene ii has been successful. Feste and Malvolio are never to be reconciled, and one of the curiosities of this play is that not all the characters at the end are reconciled to one another. Sir Toby is gratuitously rude to Sir Andrew ("An asshead and a coxcomb and a knave" V.1.203)), Malvolio vows revenge on the whole pack of them, and Feste finally reminds everyone that "The rain it raineth every day." (l.389). The dark humour is present to the end. Thucydides, the historian of the Peloponnesian War (431-404 BC), was consistently critical of Athens' imperialism, her democratic system and most of the political leaders in the war years. The major exception to this criticism was Pericles. He is clearly the hero of the opening books of Thucydides' history. He is usually portrayed in the best possible light, and is built up as the greatest Athenian at the time of Athens' greatest achievements. He seems to have had superior qualities in many different fields. He was a constitutional innovator, an orator, a patron of the arts, a general of distinction, and above all a consummate politician. Thucydides provides plenty of evidence to justify his claim that Pericles himself was the real source of power in the Athenian democracy, and there are other sources to verify this. One can argue that the greatest achievement of 5th century Athens was the establishment of truly democratic government in a form which lasted, almost without a break, for over 100 years. Pericles had a hand in at least two of the key decisions that were made in the way the democracy should work. In 451 he introduced a citizenship law which restricted citizenship to only those with Athenian mothers as well as fathers. At a time of growing pride in Athens as an imperialist polis this law must have added to the confidence and superior feelings of the Athenian people, to say nothing of the popularity of its architect. He also introduced payment for jury service in the courts, which had the effect of making participation in the administration of justice more open to the ordinary citizen. Payment for attendance at the Assembly itself also became an important feature of the democracy. These events took place before the Peloponnesian war, so we have to rely on sources other than Thucydides, such as the Aristotelian author of the Constitution of Athens. As this document was produced over 100 years after the events we cannot totally rely on its conclusions, but nevertheless it is interesting to note that Pericles is attributed political rather than altruistic motives: in the latter case to counter the richness of his aristocratic rival, Kimon. And there is a hint that the move was not entirely successful: "Some say that he caused the courts to deteriorate since the ordinary people were more anxious to participate in the drawing of lots for jury service than were the respectable people." Socrates in Plato's Gorgias says "I myself have heard that Pericles made the Athenians idle and cowardly and talkative and greedy when he instituted payment for public office". The Aristotelian writer does not eulogise Pericles to the same extent as does Thucydides - indeed he is rather grudging in tone: "While Pericles was leader of the demos the affairs of the polis were in quite good order". However, whether or not good order existed, and whether or not the whole account is historically accurate (Professor J.K.Davies calls it "dismally unsatisfactory"), it does provide further evidence that Pericles achieved significant political power. Thucydides had plenty to say on the subject of Pericles as orator. "He was so highly respected that he was able to speak angrily to them and contradict them"; "He was under no necessity of flattering them"; "When he saw that they were going too far in a mood of over-confidence, he would bring back to them a sense of their dangers; and when they were discouraged for no good reason he would restore their confidence" (2.65). If the three great speeches attributed by Thucydides to Pericles - the suggested response to the Spartan embassy in 432 (1.140-144), the funeral oration (2.35-46) and his last speech (2.60-64) - bear any relation to what he actually said, then his oratorical powers were indeed supreme. Other sources tend to confirm this. A character in a fragment from a fifth century comedy by Eupolis says: "He was the greatest orator of all. When he rose to his feet, like a champion runner he could give the other three yards start". Plutarch, writing some 500 years later, talks convincingly of his "nobility of utterance which was entirely free from the vulgar and unscrupulous buffooneries of mob oratory". And Pericles' near contemporary, Aristophanes, describes how Pericles was able to "fan the flames" to persuade the Athenians to his chosen course of action. In any democracy the most powerful orator has power indeed. Thucydides is silent about Pericles' patronage of the arts, but if Plutarch is to be believed he was the originator of a music contest in which he laid down the rules, and more importantly was instrumental in promoting the architecture and sculpture of such geniuses as Phidias. To Pericles we probably owe the Parthenon and many other buildings in Athens at that time. Pericles used the money contributed by the empire for this, adding to the grandeur of imperialist Athens and at the same time providing employment for many - including the "disorderly and common mob". Pericles, according to Plutarch, claimed that "It is fair that the city, once she has been equipped with what is necessary for war, should turn the surplus over to works which, when completed, will bring her everlasting glory, and while being built will convert that surplus to immediate use". It is hard to imagine how Pericles could have achieved all this if he did not in reality have the reins of power in his hands. We first hear of Pericles in Thucydides as a general, and as leader of various expeditionary forces before the war started in earnest. He was recognized by Sparta as being of paramount importance before the war (1.127), and after the war had started he took personal command of the whole Athenian and allied army in the Megarid invasion of 431. "This was certainly the biggest Athenian army that had ever yet taken the field" (2.142). His experiences in the field obviously helped him to formulate his successful military strategy of placing most of Athens' strength and resources into the fleet, and of giving not an inch to Sparta in negotiations while avoiding a direct confrontation by land. The democracy clearly recognised this, electing him strategos fifteen times in succession from 443 to 429. He not only had the power of having the democratic assembly behind him, but the naval and military as well. But it was probably his political nous and shrewdness which contributed most to Pericles' power. There are several examples in Thucydides - one incident shows two examples. Archimadus, the Spartan King, was a friend of Pericles. Pericles, fearing that Archimadus, who was preparing to invade Attica, might seek to isolate him by ostentatiously not laying waste Pericles' own property in the country, and hence causing resentment in Athens, devised a brilliant solution. He simply gave up all his estates and houses and made them public property (2.13). He then embarked on a detailed account of the healthy state of Athenian finances and resources, and this turned the scale in persuading the country people to withdraw to the heavily fortified and defended city itself, rather than trying to meet the Spartans by land (2.14). All successful politicians are sneered at, and Pericles was no exception. Plato, whose Socrates is unashamedly anti-democracy, has him saying "Without any sense of moderation or justice they have filled up the polis with harbours and dockyards and walls and tribute and rubbish like that, so that when they are overtaken by lassitude the citizens will blame their advisers of the time and praise Themistocles and Kimon and Pericles, who are the cause of these evils". It is Pericles that is pointed at as the source of power, not the people. Before we leap to the conclusion that Pericles was so powerful he could do exactly what he liked, we must remember that in 430, after the Spartans had invaded Attica and the Athenians were being ravaged by the plague, the assembly were so angry at Pericles' war-mongering policies that they imposed on him a fine. It took all his rhetorical powers to win back their favour - as Thucydides succinctly put it: "As is the way with crowds, they re-elected him to the generalship and put all their affairs in his hands" (2.65). Clearly he still had the need to carry the assembly with him. The most important reason, apart from his superior oratory, that he was able to carry the assembly in this way was that his policies were nearly always right from the Athenian point of view. His colonialist expansion policies had brought increasing tribute to Athens, and hence increasing prosperity to the Athenian working classes. His imperialistic aggrandisement of Athens made the ordinary citizens feel good, and as a scion of an aristocratic family they could look up to him and respect him without any feelings of jealousy. He was always keen to ensure that there was occupation for all, especially at times of peace, and he had an eye for a populist gimmick when the need arose - for example when he was quick to attribute the miracle cure of one of Phidias' workmen who had fallen off a building, to the Goddess Athene, to whom he immediately raised a statue. And most importantly of all, his conduct of the war up to the time of his death had been relatively successful - he could not be held responsible for the catastrophe of the plague, from which he was himself destined to die in 429. In conclusion, a man who was clearly recognised as first citizen in the city of Aeschylus, Sophocles, Euripides, Anaxagoras, Socrates and Phidias, at a time when Athens was at the zenith of its power as an imperialist state, justifies Thucydides' claim that "In what was nominally a democracy, power was really in the hands of the first citizen" (2.65). Ancient Greece is usually credited with the invention of "democracy", and sometimes "politics" as well. A question that is sometimes posed is whether or not these words obscure the actual nature of Athenian internal politics. Today both these terms, particularly "democracy", carry large amounts of extraneous baggage with them, and mean different things to different people. It is therefore important to examine carefully, as far as available sources will allow, the political institutions of fifth century Athens and to compare them with our own. At the end of the sixth century, Kleisthenes had initiated the first steps in setting up what came to be known as the "demokratia". In order to make the aristocratic families less dominant, he created ten new "tribes", organized on a geographical basis, and secured them representation in a new Council of 500, replacing Solon's original Council of 400. The relationship between this Council and the Assembly of Athenian citizens developed considerably over the next 50 years, but the task of understanding this development is not made easier by the lack of reliable sources. A key source is "The Constitution of Athens" by Aristotle (or his associates), but this was written some 150 years or more after the event and therefore cannot go unchallenged as gospel truth. This document describes how, after the traumas of the Persian wars, the two most powerful men in Athens were the great rivals, the politician Aristeides and the general Themistokles. Under the leadership of Aristeides, Athens had accumulated a great deal of money. A prosperous life was had by many, and a large number of official posts were created to administer the system: "More than 20,000 men gained their livelihood from the tribute and the official posts and from the allies .... There was public office for up to 700 men and up to 700 abroad". This seemingly happy state of affairs, however, did not last. The main source of power, apart from leaders such as Aristeides, still lay in the Council of 500. "For about seventeen years after the Persian Wars the constitution remained the same, supervised by members of the Areopagus, although it was in decay". What this decay was, we can only guess at: in modern times any constitution which keeps power in the hands of an elite for a long time is doomed to failure, usually through a combination of unrest from those without power, and corruption and decadence from those in power. In Athens, the leader of the people was now Ephialtes, who "attacked the Council and removed many of the members of the Areopagus by alleging irregularities in their administration. .... he took away its newer powers including its guardianship of the constitution and gave some of these to the council of 500, some to the people and some to the law courts. He did this with the assistance of Themistokles". There is no discussion of the motives of Ephialtes, nor a description of the workings of this new constitution. Maybe he was acting in concert with Themistokles as an opponent of Aristeides, or maybe he had a genuine reformist passion. (At all events it did him personally no good as he was murdered shortly afterwards). It is clear from other sources that a constitutional revolution had now taken place. Few documents in the form of inscriptions or decrees dating before the 470s have been found, but from about this time on they are fairly numerous, and it is possible to build up from them a picture of how the constitution worked in practice. J.K.Davies sums it up neatly in his "Democracy and Classical Greece": "The documents reveal the importance of the Assembly as the effective sovereign governing body; the importance which the Council of 500 came to have as the main executive organ of government; the way in which amendments to proposals could be and were made from the floor of the assembly; and the devolution of power to the citizenry via the proliferation of committees all reporting to, and depending on, Council and Assembly". Professor Davies goes on to cite as an example a document which is a record of some resolutions by the Assembly concerning financial maladministration in the setting up of new Sanctuaries to Demeter and Kore. The Council had proposed some sort of Steering Committee to investigate it, but one Thespieus, arguing from the floor of the Assembly, convinced them they should set up a five-man paid Administration Board to deal with the scandal and with future administration. The fragments of a supplementary amendment proposed by another assembly member also exist. The parallels with the working committees of our own democracy are striking. But in other respects some of the differences are also striking. Athenians were clearly proud of their citizenship of Athens, and this was jealously guarded. Pericles indeed procured agreement that no one should be a citizen unless both his parents were citizens. At this time (about 450), Athens was a huge and thriving city carrying out extensive public building works, and there was plenty of employment for people in many professions and walks of life. Athens therefore became a magnet for outsiders from other Greek states and from beyond Greece itself, to say nothing of the many thousands of slaves employed in the silver-mines and elsewhere. None of these people were granted full citizenship rights, and therefore played no part in the political life of the city. Nor, of course, did women: despite the fact that the prime deity of the city was Athene, and that the role of women in Athenian society was recognized and respected. Unlike modern systems, legislation in the Assembly was not enacted by elected representatives, but by the entire eligible citizenry. Citizens were chosen for the Council from the tribes, and, with the important exception of generals, to various official posts by lot. Political parties of the modern kind were unknown, but there were various clubs and associations where men of influence gathered and discussed political issues. For example, Thucydides describes how Pisander, wishing to gain support for his projected coup in 411, "made contact with the clubs that already existed for mutual support in lawsuits and elections". One consequence of the democratic system was that powerful orators and masters of rhetoric achieved great influence. Pericles, we know, was a magnificent orator. A fragment from a fifth century comedy by Eupolis says: "He was the greatest orator of all. When he rose to his feet, like a champion runner he could give the others three yards' start". This reliance on oratorical skills had its dangers, and led in some cases to unsuitable demagogues achieving too much power. The intellectuals of Greece were more interested in acquiring numeracy and cultural skills than in learning the art of politics. Plato singled out for comment the lack of success of the politically uneducated sons of Aristeides, Themistokles and Pericles. Thucydides blamed the disaster of the Sicilian expedition of 413 on too much demagogy. "Because they were so busy with their own intrigues for securing the leadership of the people, they allowed this expedition to lose its impetus, and by quarrelling among themselves began to bring confusion into the policy of the state". The Assembly was extremely powerful, and there was no upper house or supreme court to overturn its excesses. Political leaders were always accountable to the people, and they were sometimes subjected to fines (Pericles in 430) ostracism (Themistokles in the 470s and Kimon in the 460s), and sometimes even death (the commanders after the battle of Arginoussai in 408). Other evidence exists for this notion of accountability. In Aeschylus there are several examples: for instance in The Suppliants the King of Argos says: "though I am sole king, I cannot act in your case without my people". There was, naturally, opposition to the idea of democracy, usually expressed as a desire for a return to an oligarchic system of government by an elite few. Notable amongst these critics was the author now usually known as "The Old Oligarch". He disliked democracy because it meant one had to "prefer the interests of the mob to those of respectable people". However he was so imbued with democratic principles that even he acknowledged: "it is appropriate that in Athens the poor and the common people should seem to have more power than the noble and rich..... that they should all share in the offices of state by the processes of lot and election and that anyone of the citizens who wishes should have the right to speak in the Assembly". He believed the constitution could not be changed without eroding the democracy. In this he was correct - the oligarchic revolutions of 411 and 404 both failed, and it was eighty years later that democratic Athens was finally crushed. It is probably safe to conclude that in its heyday, democracy and the idea of power in the hands of the ordinary Athenian male citizen, were so much part of the political system at Athens, that our careful use of the term "democracy" need not obscure the actual nature of Athenian internal politics.